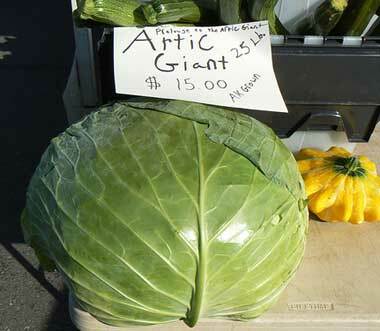 25-pound cabbage in Anchorage, Alaska market; photo by Janet Crum on Flickr (noncommercial use permitted with attribution / share alike). According to the U.S. Department of Agriculture Natural Resources Conservation Service, the soil that was chosen to represent Alaska is Tanana, named after the Tanana river (the name Tanana is derived from the Athabaskan word for "mountain river"). Tanana soil is found in the Fairbanks area and extensively throughout the lowland areas of interior Alaska. Tanana soils are important to agriculture in Alaska. They support a native plant community of aspen, paper birch, white spruce, and black spruce. When cleared and cultivated, tanana soils are used for hay and pasture, small grains, and vegetables. Alaska has 318 different soil types and approximately 15 million acres of soil that is suitable for farming. Because of nearly constant sunlight on summer days, some crops can grow to enormous size. Examples include a world record 19-pound carrot, a 76-pound rutabaga, and a 106-pound cabbage! 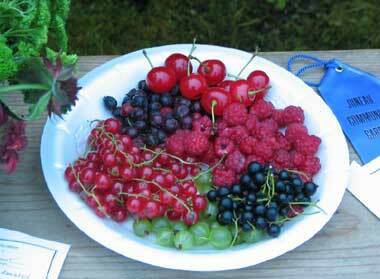 Fruit grown in Alaska - photo by Alaskan Librarian on Flickr. (noncommercial use permitted with attribution / share alike).